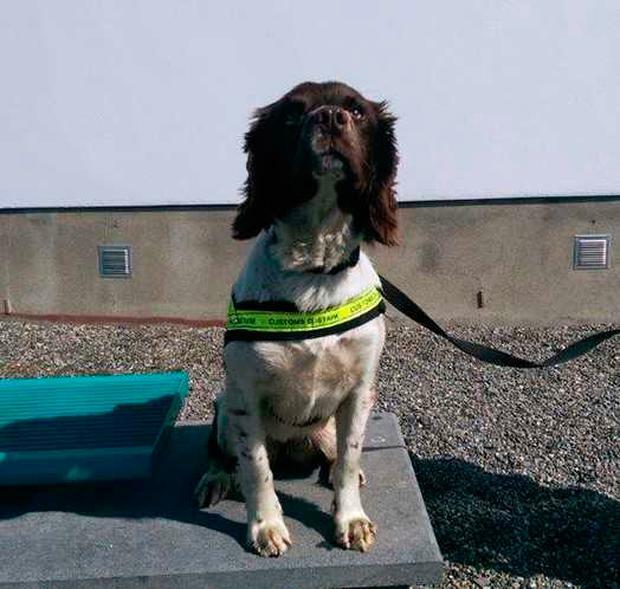 A detector dog named Meg has helped to sniff out €1.36m worth of herbal cannabis at Dublin Port. The drugs, weighing 68kg, were found on Tuesday during routine operations by Revenue’s mobile X-ray scanner and the specially trained dog. They were found concealed in a consignment of goods which had arrived into Dublin Port originating in Spain. Investigations into the discovery are ongoing. Separately, Revenue officers seized almost 12,000 unstamped cigarettes with the help of gardaí and detector dog Bill. The illegal tobacco products were uncovered during a search carried out, under warrant, of two residential properties in the Dundalk area. The retail value of the ‘Excellence’ and ‘NZ’ branded cigarettes is over €8,000, representing a potential loss to the Exchequer of €6,500. A woman in her 20s and a man in his 40s were interviewed and a file is being prepared with a view to prosecution. These seizures are part of Revenue’s ongoing operations targeting the importation of illegal drugs and the sale and supply of cigarettes and tobacco products in the shadow economy. Previous articleHow do I become an account manager?